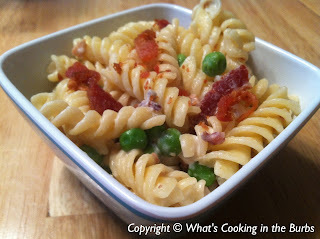 There is nothing better than bacon in pasta. This dish was right up my ally and I was able to make it Weight Watcher friendly which is even better! The whole family loved it, even my toddler! In a large skillet add 1 tsp olive oil and cook garlic until golden brown (about 3 minutes). Add in the milk, half/half, and cream cheese. Whisk until smooth. Continue cooking for about 2 minutes. Add in the Parmesan cheese, whisking constantly until thickened. Reduce heat to low. Stir in the peas and bacon. Add pasta to skillet and toss lightly in sauce. Top with additional crumbled bacon if desired. Serve immediately. Enjoy! Creamy? Bacon? You had my attention immediately! And the peas not only add additional taste but balance the colors nicely :-) Thank you for sharing your recipe at the ALL MY BLOGGY FRIENDS party!